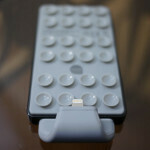 By now, we’ve had our fair share of scoping out various charging cases. In general, we adore that they provide some extra juice on the road, but they notoriously add some serious bulk and weight to our once skinny and lightweight smartphones. Moreover, the majority of them encase our devices – forcing us to live with the fact that they’re busting out of the seams while they’re stuffed in our pockets. Taking an interesting approach, we recently handled PowerSkin’s latest charging device – the weirdly named “PoP’n Hybrid Charger.” Interestingly enough, it’s really “PoP’n” with is suction cladded surface. Rather than being an actual case, the PowerSkin PoP’n Hybrid Charger gives us the flexibility of being externally attached to our smartphones. Checking it out for the first time, we were a bit skeptical on how well it’d adhere to our smartphones – but in reality, the suction cups manage to stick on firmly. Currently, the PowerSkin PoP’n Hybrid Charger is available in two specific configurations – one made specifically for the iPhone 5 with its Lightning charging tip, and another one with a microUSB connection for other devices. With the later, we’re able to use it with a Samsung Galaxy S III, since its microUSB port is located directly on the bottom edge. Honestly, we appreciate that the charging connectors are flexible, but they’re a bit cumbersome looking. Packing along a 2,000 mAh battery, we’re able to charge a dead iPhone 5 back to 100% capacity in just over an hour – with only a single bar left to indicate some additional juice is still present. There’s a button in the rear of the chargers to show us how much juice is left in the battery, while a microUSB port on the side allows us to charge the internal battery. Overall, some will appreciate the interesting way the PowerSkin PoP’n Hybrid Charger suctions to our devices, but in the end, it’s still a bulky attachment – though, it’s rather lightweight. At $70 for the microUSB variant and $80 for the Lightning port version, it still might be a bit much for some people to swallow. For roughly the same cost, you could pick up one of those beefier universal battery charging packs, but hey, this offers the flexibility of being attached to our device on the go. Amazing my Razr Maxx HD doesn't suffer from this "battery draining" issue like the iPhones do. Hmm, interesting. It's thin too and doesn't require a bulky addon just to get a days worth.